The family is the basic foundation of a country's culture and progress. On its 35th year, Jollibee held it's 3rd Family Values Awards at Crowne Plaza Galleria in Mandaluyong last Tuesday. Aside the Golden Bee Awards, Jollibee's 3rd Family Values Awards paid tribute to families for noble deeds making a world of difference at home and overseas. After two month search from more than 1200 nominations from across the country and the globe, Jollibee's 3rd Family Values Awards hosted by Christine Jacob-Sandejas and JC Cuadrado featured families that helped make a difference in their communities. Among them were Mr. and Mrs. Danilo and Jacqueline Rayo and family of Sta. Ana Manila, Mr. and Mrs. Rex and Marissa Bernardo and family of Camarines Norte; Mr. and Mrs. Jose and Gloria Supanga and family from Camarines Sur; Drs. Egidio and Thelma Lio and family from Antique and Mrs. and Mrs. Anton and Marie Joyce Lim and family of Zamboanga City. 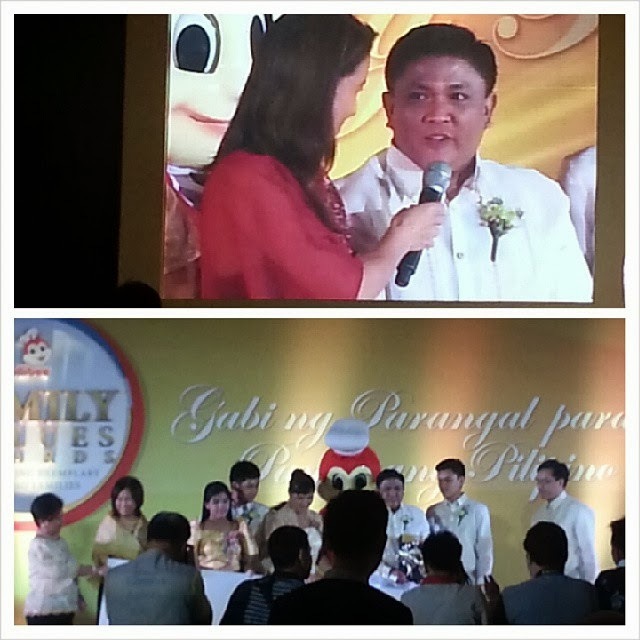 For showing compassion to Pinoys from abroad were Mr. and Mrs. Michael and Glenda Duque and family of the United Kingdom chosen to be the first recipient of Global Pinoy Family of the Year Award. Co-presented by Coca-Cola Philippines, this recognition pays tribute to Filipino families who have family members or even the whole family living overseas but still working together towards meaningful pursuits to benefit the communities. 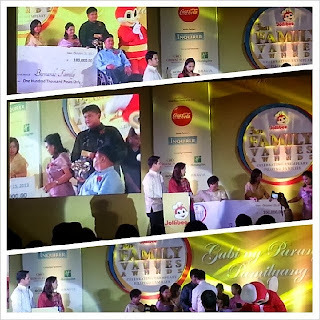 With the generosity of Mr. and Mrs. Cirilo and Vilma Carmona and family whose members are found in Spain, Bahrain and the United States helping communities in their hometown at Oriental Mindoro, Jollibee Foundation also gave a Special Citation Award. 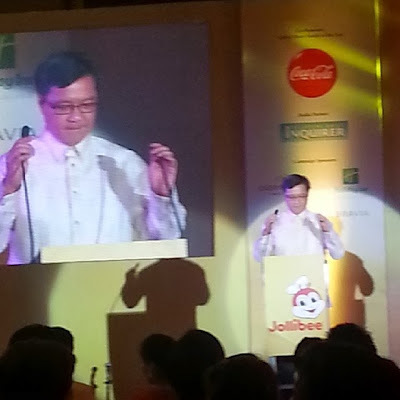 Before the announcement of the winners of Jollibee's 3rd Family Values Awards, Jollibee Philippines President Joseph Tambuntiong offered a moment of silence praying for the victims of the recent earthquake in Central Visayas. DSWD Secretary Corazon Dinky Juliano-Soliman also acknowledged families and Jollibee Foundation continuously helping the relief operations in the affected areas of the earthquake days before the event. Special performances from Whiplash, Juris Fernandez and Kris Lawrence entertained the audience reminiscing Jollibee jingles that spanned three decades. We also had the privilege to watch the mother and daughter tandem of the Divine Diva Ms. Zsa Zsa Padilla and Cinderella Karylle perform a duet from Karylle's new album during the program.